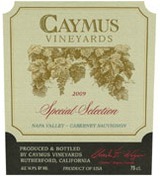 Caymus Vineyards produces two Cabernets Sauvignons - a "Napa Valley" and the venerable "Special Selection". Both Cabernet bottlings have aromas and flavors which can only be achieved through "hang time" - a technique which chances the loss of crop if early winter sets in. Leaving the fruit to "hang" on the vine unusually long develops suppleness, increases color, and matures the tannins of the grapes. The wines are abundant in textural tannins yet soft as velvet. Crop thinning, allowing measured sunlight to reach the vine's fruit zone, and waiting for increased ripeness are all part of our viticultural practices. Caymus Cabernets offer a wide array of aromas and flavors including cocoa, cassis and vanilla. Caymus Special Selection is the flagship wine of the Wagner family and is comprised of the very best barrels of the vintage. This wine is not produced in difficult years. So delicious now, you can hardly keep your hands off it. Blackberry tart, ripe blueberry, cassis, milk chocolate, licorice and sweet, smoky cedar flavors flood the mouth, dramatically huge and memorable, and lasting long into the finish. The tannins are obvious, but sweetly ripe and soft. A brilliant evocation of Napa Cabernet, despite a high production level of nearly 30,000 cases, which is about the same size as a Bordeaux first growth. Shows the class and potency this bottling has exhibited for many years, and believe it or not, the price is a is a relative bargain these days. Drink now - 2020. Temptingly rich and layered, with complex mocha, plum and wild berry fruit that's spicy and aromatic. Full-bodied, gaining depth and turning ever more elegant and detailed, with tannins that give this traction. Drink now through 2019. 29,820 cases made.